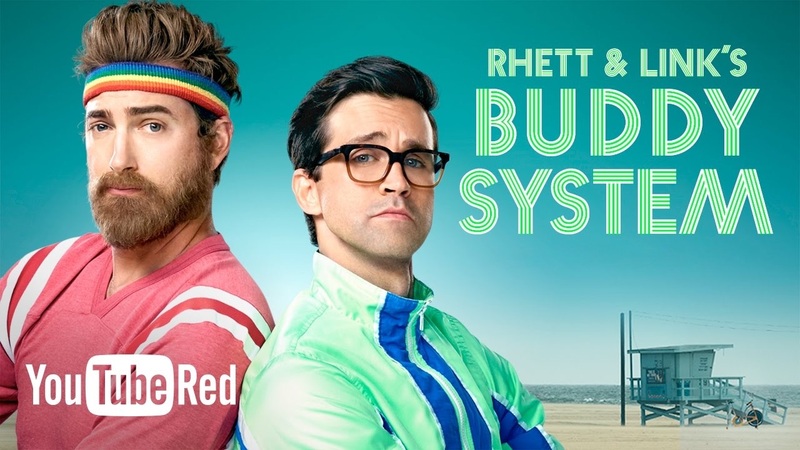 Announcing Rhett and Link’s Buddy System, a new comedy show from the fine folks at YouTube Red! I had the privilege of writing the music for this show along with composer/guitarist Graham Fink. Rhett & Link are an Internet comedy duo from North Carolina. Self-styled as “Internetainers,”, they are known for their online viral videos, comedy songs, ten-episode TV series Rhett & Link: Commercial Kings for the Independent Film Channel, and more recently, their daily morning talk-show, Good Mythical Morning. In their 2008 documentary, Looking for Ms. Locklear, they chronicled their search for the first grade teacher in whose class they met for the first time. The duo runs a number of YouTube channels including Rhett & Link, which has over 669 million views and over 10 million subscribers. and Good Mythical Morning, a talk-show posted on weekdays at 6:00 am EST with over 2.7 billion views and 11 million subscribers as of September 2016 (making it the 44th most-subscribed YouTube channel). The first episode, called “Tucked Up,” is available for free viewing on YouTube (and is embedded below), and it’s all about how Rhett and Link find confidence in their underwear. (This show is officially rated PG-14 but I find it entirely suitable for kids.) The remainder of the series requires a YouTube Red subscription to watch.